SDC-2300 delivers on a 25yo scrape. Back in ’95 we took over a Prospecting Lease; the previous owners had done some work with a bobcat barely scraping the rocks off about 1 hectare in total. We arrived with Garrett Groundhogs and the then new Whites Vsat’s and immediately found gold they had left. Through the coming years we advanced through the Minelab range occasionally revisiting these scrapes and always finding a few more pieces. Two of my mates recently purchased a SDC-2300 each and were fortunate to receive some firsthand tuition on how to gain the best out of this amazing machine. The two decided they would give the scrapes one more try. Low and behold 4 hours later they returned to the camp and sat down with a couple of frothies and realised they had a total of 81 nuggets from what they believed had to be barren ground. C – 27 total = 7grams. Two very happy fellas who can’t wait to get back and swing over some virgin ground, only 199 hectares to go. Re: SDC-2300 delivers on a 25yo scrape. Hi Nightjar, My wife just picked up a new SDC 2300 along with the new Coiltec coil, we just have to wait till it cools down a bit before going up north. You could have saved yourself a few hundred $$'s JS. With the SDC you don't need to void your warranty messing with an unproven coil. Did the dealer mention warranty? Hard to see what can go wrong. We hope to have some fun finding gold when trying it out. 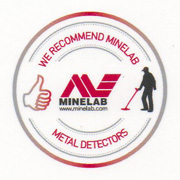 Hippyty, You obviously haven't read the latest Minelab warranty release? And it's definitely your choice what you do with your machine. You can buy another coil and adaptor cheap in Meekatharra, advertised on supermarket notice board???? I’ve read the advertised warranty statement, didn’t stop me swapping coils, it also worth noting how much dust gets trap under the plate that covers the coil plug, mine needed a good blow out.The only damage I can see happening is reinstalling the old coil which won’t be happening. It would interesting to see if minelab start putting tamperproof screws and warranty void stickers on new sdcs they send out. I suggest snapping up the cheap coil and crank it up to 5 and swing away.